On 18 November 2016, the Board members of Zeewolde Development Association signed the founding documents of Windpark Zeewolde BV. Approximately 200 residents, agricultural entrepreneurs and turbine owners from the project area and a civil society cooperative now became shareholders and together finance Zeewolde Wind Park. Never before has a Dutch wind park been developed with so many shareholders from the immediate vicinity. The members of the provisional management of Windpark Zeewolde BV (rear row, Tonko Tonkes, Co’nn Rennen, Wim Veldboom, Jan Veenink and Marinus van Es) and the first members of the provisional STAK-management (Jan Schelling, Walter Kempenaar, Gerard Macleane) signed the documents for the foundation of Windpark Zeewolde BV. 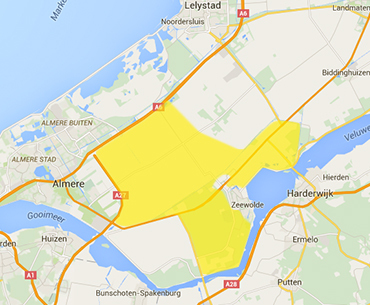 Over the past 1.5 years, all residents, agricultural entrepreneurs and owners of land from the project area (Northwest of Zeewolde to the east of Almere, see yellow area on the map below) could join the Windpark Zeewolde Development Association. This is the largest development association for a wind park in the Netherlands, with approximately 200 members. The Development Association has now been converted into a B.V. because the license application must be submitted by the entity that operates the Windpark. The members together will finance the development of Zeewolde Wind Park; The Zeewolde Wind Park is thus literally developed by the region. Which is unique for a park of this size, and will give a strong boost to the regional economy. The development area (in yellow) of Zeewolde Wind Park. The forerunner of the Development Association was the Wind Association, which was established in 2013 to involve all owners of mills, land and homes and all users of land in the development area in the process of scaling up and remediation. By joining the Development Association (and later the BV. ), as many inhabitants as possible in the area could actually participate in the new wind park. Now that the B.V. has been set up, the role of the Wind Society will probably lapse. The residents in the immediate vicinity of the park are also given the opportunity to participate in the construction of the wind farm; in 2017, De Nieuwe Molenaars (The New Millers) was established for residents of Almere and Zeewolde who live just outside the project area. Because the cooperative has a share in the wind farm, the members of the cooperative can also invest and participate. Read more about The New Millers here.